Increasing the number of suppliers subject to Ferguson’s anti-slavery standards. Harmonizing anti-slavery measures across our businesses. Developing a risk assessment tool to enhance the effectiveness of our measures. Ferguson is comprised of four regional businesses in the United States, United Kingdom, Canada and the Netherlands. Whilst collectively, Ferguson buys products from approximately 43,000 suppliers in 36 countries, each business establishes its own supplier network. The chart below highlights key features of our regional supply chains. Ferguson holds itself to high standards of business integrity and ethical conduct. Committed to extending the principles of the UN Global Compact and Universal Declaration of Human Rights to our workforce, we have adopted policies to foster a respectful environment where associates are treated humanely and free from harassment or discrimination in safe and secure workplaces. These principles are embedded in our Group Code of Conduct and company-specific Codes of Conduct adopted by our regional businesses. Our associates, including those employed by our sourcing affiliates in China and Taiwan, are trained on the Code of Conduct and are encouraged to “speak up” about any situation or condition believed to violate our fundamental employee welfare standards. Moreover, the Group Whistleblower Policy and Speak Up! hotline offer a confidential mechanism for associates to report (anonymously, if they chose to do so) any incidents of unfair treatment – protected from retaliation by management. During this past fiscal year, no reports have been made raising any concerns about use of forced, involuntary, or child labour at any Ferguson location. Ferguson also holds our suppliers to high standards of ethical conduct and treatment of workers. The Group Product Integrity Policy codifies our commitment to source from ethical suppliers to ensure the products we supply are safe, reliable, and manufactured by companies that share Ferguson’s values of integrity and respect for the human dignity of workers. Having adopted the Group Product Integrity Policy, our businesses have operationalised the policy framework in their respective supply chains. Suppliers are contractually obligated to respect human rights – a cornerstone of the ethical component of our product integrity programme. For example, agreement to respect human rights and refrain from use of child, forced, or involuntary labour are explicit contractual provisions in the UK business’s terms and conditions of purchase, whilst our Canadian business requires its major suppliers to execute its Supplier Standard Agreement, which requires compliance with human rights laws and ethical standards found in the Group Code of Conduct. 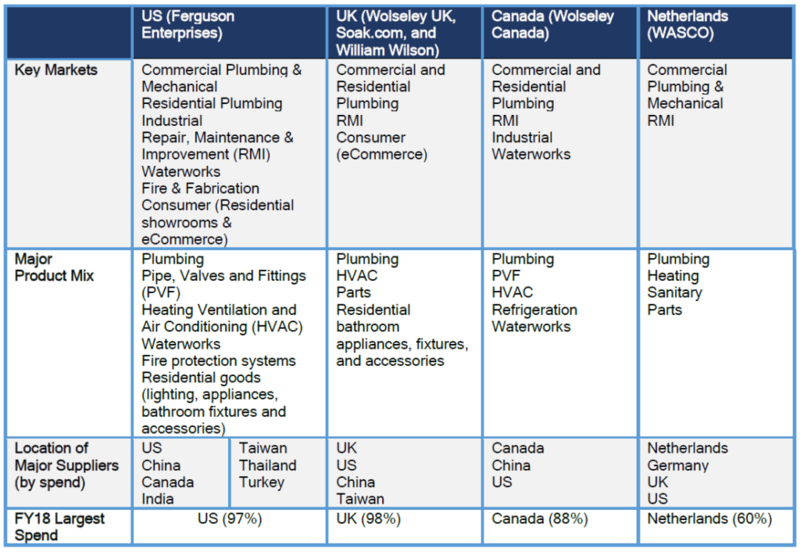 The US business binds its major suppliers to a Supplier Code of Conduct. Amongst other terms, the US Supplier Code of Conduct sets forth minimum standards of human rights and working conditions that are subject to on-site inspections and audits. The US Supplier Code of Conduct is also incorporated in supply agreements negotiated with Asian suppliers. Eighty percent (80%) of the US business’s major US suppliers have signed its Supplier Code of Conduct, with approximately 50% of its major global suppliers under similar contractual terms. Ferguson has achieved notable success during FY18 to bring major suppliers of its regional operations under contractual human rights commitments. In total, 1,307 suppliers have contractually pledged to abstain from use of child, forced, or involuntary labour in their operations. Approximately, ten percent (10%) of these major suppliers are in countries with a prevalence of modern slavery according to The Global Slavery Index. Utilising a third-party software program, Ferguson screens new and existing suppliers for reports of ethical or modern slavery concerns. The monthly screens ensure that we capture new information that comes to light after a new supplier is uploaded in the system. During FY18, the ongoing screening process identified no red flags of unethical or modern slavery incidents involving any of the thousands of screened suppliers. During FY 18, our businesses enhanced their sourcing due diligence activities by incorporating ethical and anti-slavery reviews in the vendor onboarding process. Our UK business requires new vendors to submit policies and other documents that evidence the supplier’s commitment to anti-slavery standards. Also, equipped with tactics from in-person modern slavery training conducted in September 2017, the US business’s Taiwanese sourcing associates began to verify absence of child labour during pre-qualification examinations of Chinese suppliers. All businesses have begun incorporating, to varying degrees, ethic and anti-slavery elements in their supplier audit methodologies. During FY18, 52 ethical audits were performed on suppliers in China and Taiwan. The US business’s external auditor incorporated child labour and worker conditions observations in its audit of 30 PVF suppliers in the US, China, India, Italy, Malaysia, Mexico, S. Korea, Thailand, Ukraine and the UAE. An audit performed by our UK business identified non-compliance with Ferguson’s standards concerning physical conditions of employee dormitories. However, with active engagement of our UK product integrity team, the supplier implemented corrective action and remediated the issue. None of the other FY18 vendor audits identified non-compliance with Ferguson’s standards. Although work remains to harmonize practices across the businesses and to expand the scope of ethical and anti-slavery standards in our audit methodologies, these due diligence activities have facilitated our sourcing and product integrity teams’ understanding of our global suppliers’ operations beyond quality considerations. Suppliers will be rated using these criteria with the level of engagement correlated to the supplier’s rating. For example, application of this tool will direct high priority engagement to suppliers in China, India, or the UAE compared to suppliers in Japan or South Korea. High priority engagement may entail review of the supplier’s employment practices, increased frequency of on-site monitoring and audits, work plans for corrective action, and capacity building activities to support the supplier’s adoption of specific anti-slavery controls. Prioritization of engagement with suppliers, regardless of spend, will ensure effective deployment of resources in our anti-slavery compliance program. We recognise the need to develop additional tools to effectively engage our suppliers, particularly those in high risk countries. As our framework matures, key performance measures will help test the effectiveness of our programme. We will also monitor best practices as they develop in sectors relevant to our business, consulting with external stakeholders as appropriate to help strengthen our efforts. Deploying the risk assessment tool to all regional businesses. Identifying ways to incentivize suppliers to implement anti-slavery compliance programs at their facilities. Conducting supplier surveys to enhance our understanding of labor and employment practices. Developing key performance indicators to measure the effectiveness of our anti-slavery activities. Ferguson remains steadfast in our commitment to eradicating any form of modern slavery in our global supply chain. By our actions, our major suppliers will know that humane treatment of their workers is just as important as the quality of goods supplied to Ferguson. Sources relied upon in Ferguson’s assessment include: Country Profiles in The Global Slavery Index; “Strengthening Protections Against Trafficking in Persons in Federal and Corporate Supply Chains: Research on Risk in 43 Commodities Worldwide,” Verité 2017 Report Commissioned by the U.S. Department of State; and Transparency International’s Corruption Perceptions Index. Copyright ©2019 Meridian Valves. All Rights Reserved.